Exposure. Sun near the coast, light shade inland. Introduce nursery-grown succulents to sunny locations gradually or their leaves may sunburn. Soil. Fast-draining. Amend garden soil with pumice, decomposed granite, or coarse sand, or plant in fast-draining -cactus mix from your nursery. Watering. 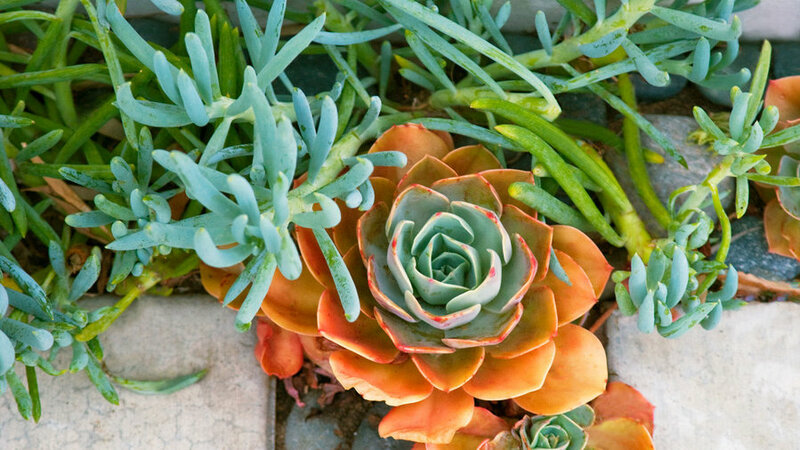 Although most succulents are drought-tolerant plants, prolonged periods without water may cause their leaves to lose color, shrivel, or drop. The amount of water needed depends on heat, humidity, and rainfall. Give plants just enough water to keep them plump and attractive. Occasional deep watering will help remove salts from the soil. When siting them near plants that need more water, position succulents atop small mounds of amended soil so that water drains away from the roots. Grooming. Many succulents need little tending other than removal of spent flower stalks. Feeding. One light feeding at the start of the growing season should be enough for most succulents. For more vigorous growth, feed several times during the growing season at half the recommended dose. Larger and later-blooming kinds, as well as container-grown plants, may also benefit from additional fertilizing.